Plastic Free Showering Is Here! Zero-plastic toiletries delivered right to your door. The easiest way to ditch single-use plastic in your bathroom and enjoy a shower that's good for you and the planet. Create an account and sign up for monthly deliveries. We don't do contracts, so you won't be tied down. We fill a box with solid bars of shampoo, conditioner, body wash & shaving foam, and pop it in the post to you. Your box arrives straight to your door. The packaging box is 100% recyclable. Zero waste, zero faff. Everything you need for a zero-plastic shower that's good for you and the planet. 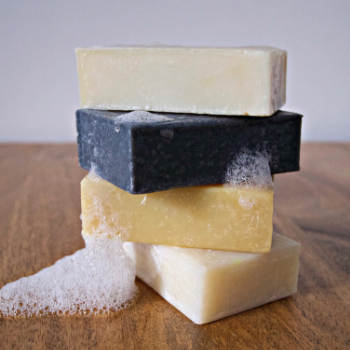 Each box includes a solid shampoo bar, conditioner bar, body wash bar and shaving foam bar - all made in the UK using vegan-friendly plant-based oils, shea butter, essential oils, herbs, flowers and spices. Packaging now accounts for almost half of all plastic usage, and approximately 8 million pieces of plastic enter our oceans every single day. Lather Box donates a percentage of profits to UK charity, Surfers Against Sewage, who run beach clean-ups and educational programmes in schools.